Size:10 Feet Hosa cables are built with the hard-working,hard-touring musician or audio professional in mind. Hosa cables areexceedingly popular, due in part to their reputation as being one of the mostaffordable and high-quality cable lines in the business. Hosa cables have alsoreceived praise for their durability and excellent performance. When it comesto audio cable design, Hosa keeps a steady eye on the basics, and you can hearthis attention to detail in their sound. To make your next music experienceextraordinary, pick up a Hosa cable today! All Hosa cables and adapters,including hard-wired stage snakes and stage boxes, purchased in the USA arewarranted by Hosa Technology, Inc. to be free of defects in material andworkmanship for the lifetime of the original purchaser. 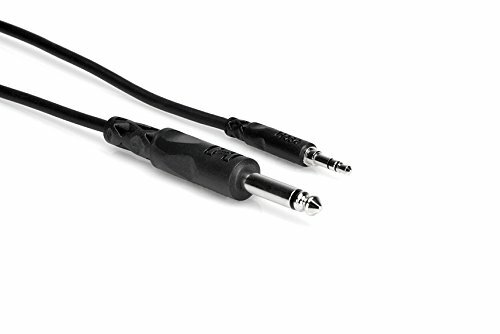 From the ManufacturerHosa Stereo 1/8" TRS to Mono 1/4" TS Cable This cable is designed to apply amono signal equally to a mini stereo phone input. It may be used to connect amixing console to a portable media player, laptop, or similar device. Featuresinclude: Nickel-plated plugs for rugged durability and efficient signaltransfer Oxygen-Free Copper (OFC) conductors for enhanced signal clarity OFCspiral shields for effective EMI and RFI rejection and flexibilityConnector(s): 3.5 mm TRS to 1/4 in TS Length: 10 ft Similar Products toConsider Hosa Cable GPR101 RCA To 1/4 Inch TS Adaptor - 2 Pack The Hosa GPR101adaptors are designed to adapt phono plugs to mono phone jacks. Hosa CableCSS105 TRS to TRS Interconnect Cables - 5 Foot The Hosa CSS100 series cable isdesigned to interconnect pro audio gear with balanced phone jacks. Hosa CableSTP201 TRS To Dual 1/4 Inch Insert Cable - 3 Feet 3 Inches Modern Mixingconsoles use Insert jacks that allow you to break into the signal path to addan outboard signal processor using just one cable.